Coachella is the hottest music festival around and definitely an on-trend theme for your next birthday party. Both my Coachella Themed Birthday Party Printables include a full collection of editable templates that will make planning your Festival or Coachella inspired birthday party easy. All the design work has already been done for you – all that’s left for you to do is type in your own text, print & cut. And they are only $12.50 for each full package! All the text in both colors is also completely editable. This means that you can type in all your own party details yourself at home. It’s super easy – all you need is the free Adobe Reader on your computer and you are good to go. Just open each template in Adobe Reader, highlight my sample text and start typing in your own. Both colors come with 2 types of Invitations: a 3×7.5 inch Ticket Invitation AND a regular 5×7 inch Invitation. You get to choose which format you want to use. All of text on these invitations is editable, so you can type in anything you like over my my sample text. Come up with your own ‘Festival Name’ then type in your party details. The editable text make the invitations work for any kind of Coachella inspired party – not just birthday parties. Simply change any birthday references to other text. You can also change the barcode at the bottom of the Ticket invites too! If you plan on going green this year and emailing out your invitations (or posting them on social media instead) you can do that too! See how here. 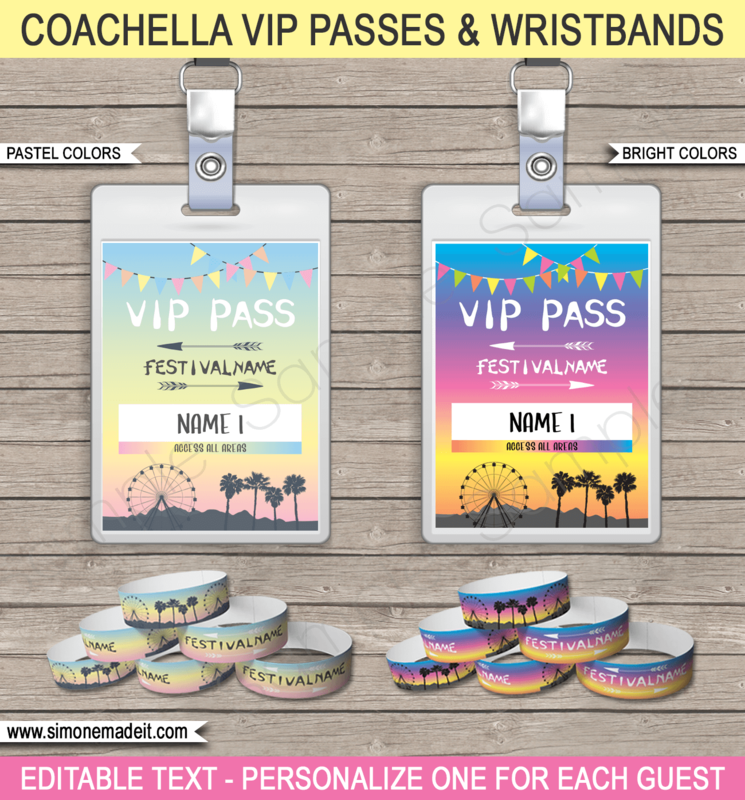 No Coachella party is complete without VIP passes and Wristbands! These VIP passes are formatted to print 6 passes per page. You personalize one for each guest by typing in a different guest’s name into each one. Have more than 6 guests? Simply change the names and reprint the page as many times as you need. Each VIP Pass is sized 3 x 4 inches and fits ID Badges from your local Copy Shop or even Walmart. Add a lanyard and they are ready to go! The 1 inch wide wristbands are perfect to give out to each guest either with their invitation & VIP Pass, or on arrival at your party. These DIY wristbands secure around your guests wrists with a piece of double-sided tape. Decorating your Coachella themed birthday party has never been easier than with these printable decorations. Personalize these templates with your ‘Festival’ name and then print these banners, signs & pennant banners. The large banner is designed for printing at a huge 2ft x 8ft size. Your local copy shop, such as Staples, can print this size on Vinyl for the perfect welcome to your Coachella inspired festival. Ask for grommets on each corner and string up the banner by the corners. (It also comes in 841 x 2201cm size for Australian customers who wish to print at Officeworks). If that large banner is out of your budget, I also have you covered with Welcome Signs that come in 4 sizes – regular US Letter size (or A4) + the bonus larger sizes: 11×17 inch, 24×36 inch and 36×48 inch. Choose which size you need, personalize and print. Australian customers are looked after too with the bonus signs available in A3, A1 & A0 sizes. Both color schemes also have a Pennant Banner included. There is a full “Happy Birthday!” pennant banner included for quick no-fuss printing, but you can also change the letters to print out your own custom banner message too. Each banner panel is sized 5×7 inches each and comes with 2 panels per page. After printing you cut out each panel and string together on a long piece of ribbon. These fun directional signs / arrows are an easy way to direct your guests to where you want them to go. The text on each arrow is editable, so you can type in your own activities or wording into each one. The arrows print 2 per page – and there are two sizes to choose from: regular US Letter size (or A4) + the bonus larger size: 11×17 inch (A3). Print, cut and staple or nail each arrow to a wooden rod or stick. If you don’t have one, you can also use double-sided tape and attach to a wall for instant impact. Each collection includes lots of different decorations to make easy Coachella themed party food. Dress up your water bottles with the 2 x 8.5 inch Water Bottle Labels. There are 5 labels per page. Simply remove the existing wrappers on small individual water bottles and replace them with these ones. You can type in your own ‘Festival’ name or customize them with each guest’s name. Folding food labels are perfect for last minute food preparation! Each label is 3⅓ x 2½ inches once cut & folded and there are 4 labels per page. Need more than 4? Just change the food names and reprint the page as many times as you like. Use these as Place Cards too by typing in guest names instead of food. Hersheys 1.55oz Candy Bars look much more festive when wrapped with these Candy Bar Wrappers. Type in your own text on the front of each wrapper (a “Happy Birthday Name” message works well here), then type in your own Nutrition Facts on the back too. Alternatively just leave my sample Nutrition Facts. Tic Tac Labels are another fun addition to your party. They also make a quick and easy small party favor! Type a short message on each label and cover the existing label of a 1oz Tic Tac box with your new personalized one. Use the 24g Tic Tacs if you are in Australia. An easy way to decorate cupcakes is with these Cupcake Toppers. Personalize them with the birthday name and age, print and punch out with a 2 inch circular punch. Attach to toothpicks and insert into your cupcake – easy! See my easy cupcake topper tutorial here for more details. Don’t have a 2 inch circular punch? You can also just cut out the squares with scissors and use them as 2¼ inch squares instead. Sending home your party favors or thank you’s is easy with these 2 templates. There are 8 editable favor tags per page – each one is 2¼ x 3½ inches. Type in your name and attach to your party favors for that personalized touch. Change the message too if you like. The Thank You Notes are sized 4×6 inches and come with 2 per page. You type in your thank you wording before printing. There are more templates included in the Coachella Themed Birthday Party Printables too! Want to see more before purchasing? See all my Coachella Themed Printables HERE IN THE SHOP!